On these pages you will find objects of my affection, for I can't sell anything that I don't have knowledge of and love dearly. 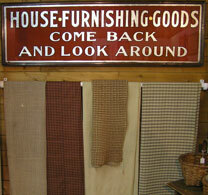 So you will find textile treasures like authentic 18th & 19th C Pennsylvania homespun linen bedsacks, tablecloths, towels, sheets, bolsters, pillow shams, stockings, and odds and ends. In addition you will find all kinds of 18th and 19th C ladies’ work: samplers, sewing rolls, pockets, quilts and pin cushions. 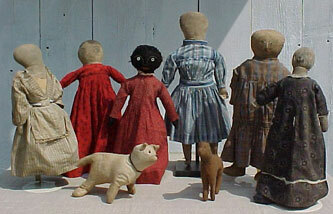 Among my favorites you will find old and cherished cloth dolls, and beloved cloth animals...Finally, please check for 18th and 19th C folk art, children’s foibles, painted smalls and Americana. 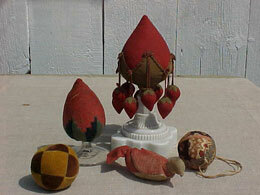 I hope you enjoy browsing my on-line shop. If you wish more information, do check my About Me pages, as well as my Adamstown, PA shop hours and show schedule. And, please, do peruse and enjoy the ever-changing show photos on my schedule page for you may spy something that makes your heart jump. It might still be available...So steal a moment to relax and enjoy! Click on the image to see items for sale in each category.